LAS VEGAS, APRIL 10, 2013 — RTW, a leading vendor of visual audio meters and monitoring devices for professional broadcast, production, post production and quality control, is proud to unveil the new TM3-SWMC Software for its TM3 series of TouchMonitors at the 2013 NAB Show (Booth C1844). This new software license, available as an add-on option, incorporates a moving coil emulation display. This license expands the functionality of the TM3 TouchMonitor series, which includes the TM3 and TM3-3G, with PPM, VU and the new loudness moving coil instruments. The display can be chosen with vertical or horizontal orientation, numeric level information and peak indicators. Single-, double- and stereo-channel, instruments are now available. For stereo groups with PPM moving coil mode, additional M/S moving coil emulation is selectable. As with all instruments in the TouchMonitor series products, the user can individually define the instrument size and positioning on the screen to meet his specific application needs. 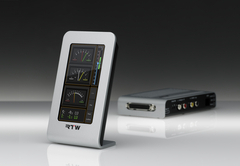 RTW’s TM3 includes features of the larger TM7 and TM9 versions in a compact size. Users can control it with a touch-sensitive display. With its budget-friendly base price, 4.3-inch touchscreen and stylish exterior allowing for horizontal and vertical placement, the TM3 is an appealing compact device, ideal for edit suites, control rooms and OB vans. 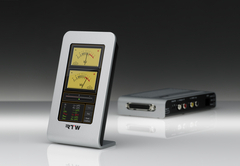 The TM3-3G, introduced in 2012, is a compact yet versatile solution for metering, de-embedding and monitoring 3G-SDI audio. It also features a 4.3-inch touchscreen for horizontal as well as vertical orientation, which can display any of the eight audio channels contained in a 3G-SDI stream.